Pivotal Cloud Foundry hosted customers can start receiving 25,000 free emails using SendGrid each month. This will give you access to advanced reporting and analytics and all APIs (Web, SMTP, Event, Parse, Sub-User). If you have a run.pivotal.io account, simply login and go to the SendGrid plan page in the Marketplace to get started with your 25,000 free monthly emails for use with your app. Sign up here if you do not have an account. The service name can be anything you want and the plan level is one of these options: free, bronze, silver, gold, platinum. The service name should match the one you provisioned above and the app name should be an existing Cloud Foundry app. Once SendGrid has been added a username and password will be available. These are the credentials you use to access the newly provisioned SendGrid service instance. The getting started guide has more background on Delivering Service Credentials to an Application. With the SendGrid service provisioned and credentials added to the VCAP_SERVICES environment variable, you can now use SendGrid within your applications. You can either use SMTP with your SendGrid credentials or one of the many SendGrid libraries. The recommended way to use SendGrid with Java is to use the sendgrid-java library. The following example uses sendgrid-java. Simply, replace your username and password with the username and password in your VCAP_SERVICES environment variable. Optionally, combine with vcapenv to avoid entering in the username and password directly. Vcapenv will do the work to automatically pull your credentials from SendGrid. See the example app Spring-Attack for a complete working example. If you prefer to use Java’s built in libraries to send emails you can do the following using JavaMail. A sample application for using Spring Framework and SendGrid on Cloud Foundry can be found here. You can quickly get started with SendGrid using Ruby on Rails ActionMailer. A sample application for using Ruby on Rails and SendGrid on Cloud Foundry can be found here. 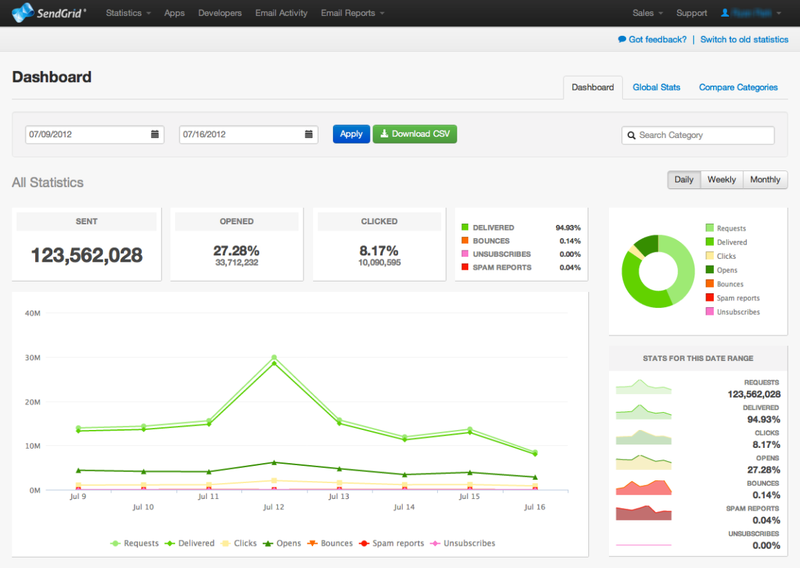 SendGrid offers statistics for a number of different metrics to report on what is happening with your messages. To access your SendGrid dashboard, click the ‘Manage’ button next to the SendGrid service in Apps Manager. To properly reference your SendGrid account within CloudFoundry, see the information about contacting service providers for support. If you have product feedback, or issues unrelated to your account, you can add it to http://support.sendgrid.com/home.